More than a dozen passengers and crew had to be treated Friday for respiratory problems when pepper spray illegally brought aboard was accidentally triggered in the cabin of a Hawaiian Airlines flight from Oakland to Maui. Flight 23 crossed somewhere over the Pacific Ocean when passengers in the front of the Boeing 767 began to smell a smell and experience respiratory problems, said the airline ABC News. The pilots declared an emergency and were given priority in Maui. The flight landed safely. This Friday, August 31, 2018, provided by Nicholas Andrade, shows people traveling to Kahului, Hawaii, in a back galley on a Hawaiian Airlines flight from Oakland, California a can of pepper spray collected went into the plane. During the event, passengers were moved to the back of the plane. 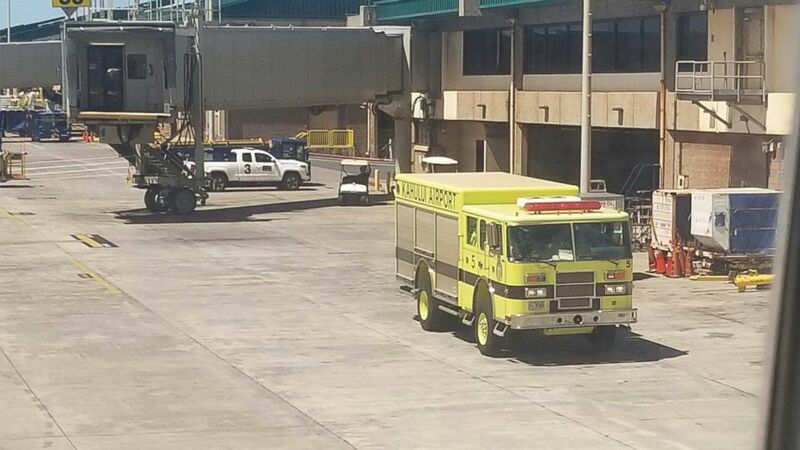 First responders treated 12 passengers and three flight attendants for respiratory problems. They were all released, the authorities said. When the plane landed, it was found that the passengers' problems were caused by a leaking can of pepper spray, which was illegally boarded by a passenger, the police said. Pepper spray is banned from all carry-on items by the Transportation Security Administration (TSA), although 4-ounce or smaller containers may be in checked baggage. The passenger is interviewed by authorities to find out how he got through the security, police said. The tank was about 1.5 ounces. The Maui Police Department is in charge of investigating the case. Hawaiian Airlines gives all passengers on the plane a travel credit of $ 500. The Federal Aviation Administration (FAA) is investigating the incident, ABC News said. ABC News has contacted the TSA to comment on the apparent failure of security screening at Oakland International Airport. The civilian penalties for bringing pepper spray into an airplane can be $ 1,960, though it may be higher depending on the circumstances of the case. The penalty for bringing a gun to an airport could be a fine of $ 13,066, according to the TSA. On board were 256 passengers and 10 crew members.